The book of Revelation promises a special blessing for those that read it. Ironically it says nothing about understanding it. 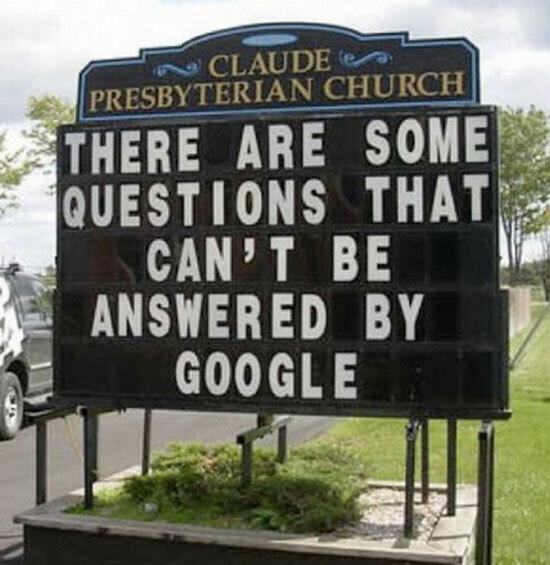 That may be because even God knows it is pretty hard to figure it out. It can also be frustrating when you begin to read the interpretations of others since it doesn’t take long to realize that they vary wildly. If you took all the theologians in the world and lined them up head to toe along the equator… you still wouldn’t reach a conclusion (rim shot). It is however important for every believer to read and study the Book of Revelation. Many who do find their lives revolutionized by the revelation of who Jesus is. That is the intent of the book. John titles the book The Revelation of Jesus Christ. There are things within this book that you just cannot discover anywhere else. You will want to tune into our television program during the month of December as I am doing a new series on the book of Revolution. Rather than trying to interpret every verse and symbol I have broken down the book into its four major themes. 1) God’s glory revealed 2) God’s judgment executed 3) God’s people empowered 4) God’s kingdom established. Everything that takes place in Revelation falls into one of these four themes. Understanding this basic framework goes a long way to allowing the reader to be able to interpret the book for themselves and embarking on their own Revelation Revolution. In this post I have included some of the companion slides for the series. In Part 2 God’s Judgment Executed I go through the three waves of judgment. 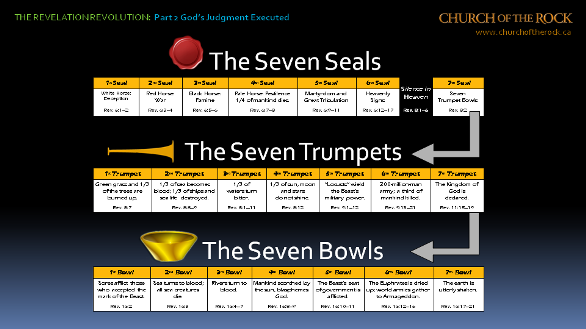 The 7 seal judgments, the 7 trumpet judgments, and the 7 bowl judgments. Few Christians today understand that God is just. Because we live in a time the bible calls the dispensation of grace many have forgotten that there needs to be a day of reckoning for the earth. If we do not receive His mercy now, we will have to face His judgment later. The first wave of judgment seems to be political in nature as the Anti-Christ begins his rise to power through deception. War, famine and death follows on the heels with 1/4 of the earth’s population perishing. 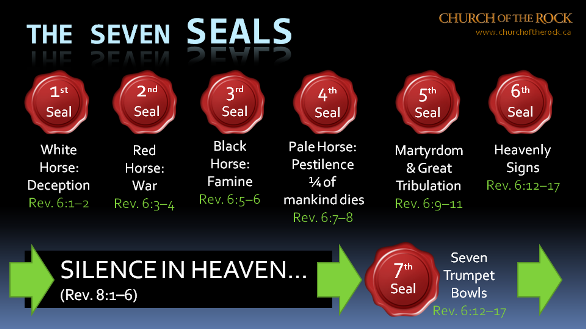 As the seventh seal is broken the 7 trumpet judgments spring forth. They seem to have a environmental nature to them unleashing ecolical disasters of an extreme that the world has never seen. 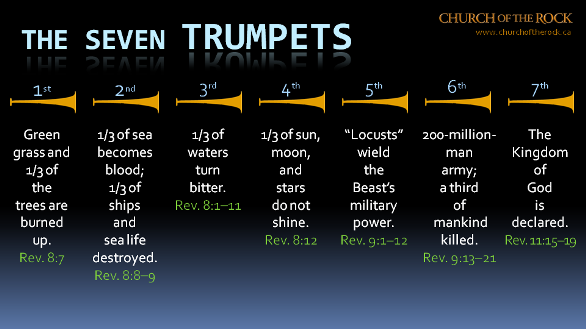 By the sixth trumpet another 1/3 of the world’s population perishes. 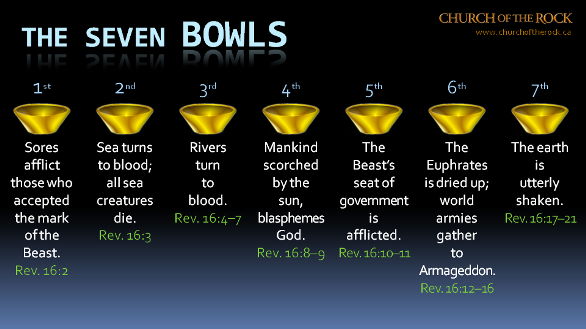 Upon the blowing of the seventh trumpet the bowl judgments are poured out. More nastiness ensues. Before you get completely filled with despair, take encouragement that the scripture promises us, Because you have kept My command to persevere, I also will KEEP YOU you from the hour of trial which shall come upon the whole world, to test those who dwell on the earth (Rev 3:10). Many have interpreted this to be a reference to the rapture and that we can expect Jesus to return for us just prior to the 7 years of Tribulation. There is only one problem with this; nowhere in scripture does it say that the rapture is prior to the time of God’s judgment on the earth. In fact it says the opposite. In John 17:13 Jesus Himself says, I do not pray that You should take them out of the world, but that You should KEEP them from the evil one. He specifically states that KEEPING us does not mean taking us out of the world. Instead, He will empower His people to overcome during this time. The timing of the rapture is actually quite clear, Immediately AFTER THE TRIBULATION of those days the sun will be darkened, and the moon will not give its light; the stars will fall from heaven, and the powers of the heavens will be shaken. Then the sign of the Son of Man will appear in heaven, and then all the tribes of the earth will mourn, and they will see the Son of Man coming on the clouds of heaven with power and great glory. And He will send His angels with a great sound of a trumpet, and they will gather together His elect from the four winds, from one end of heaven to the other (Matt 24: 29-31). Once we get through the 7 years of we will enjoy a world like we could never really imagine. Though we clearly get a taste of God’s Kingdom today the fullness is yet to come. 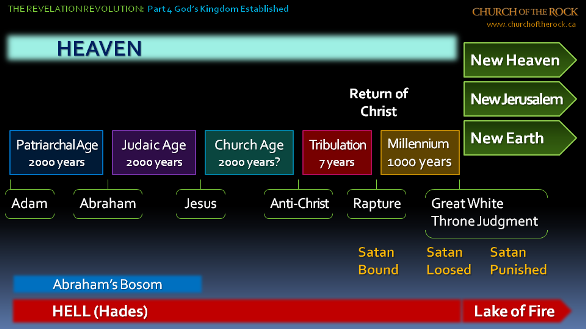 When He returns He will rid the world of the problem of evil and establish His Kingdom on the earth once and for all. Life may be grand, but the best is yet to come.